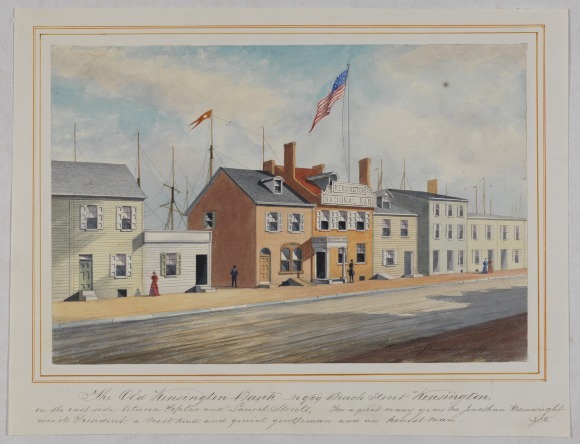 The Kensington History Project helped HSP's library staff prepare the following bibliography of Kensington-related materials in our collections. You can learn more about Kensington and the Kensington History Project in the November 2002 issue of Pennsylvania Legacies , HSP's illustrated history magazine. The Kensington Massacre. Philadelphia: S.C. Atkinson, 1845. Pam JC 585 .R47 no.1 Laughlin, H.H. Causes of the Kensington Riots Explained: In a Series of Letters to the Honorable Daniel O’Connell. Philadelphia: A.H. Rowand, 1845. Wq* .929 v.1. Breton, William L. Treaty Ground of William Penn and the Indian Natives, 1682 of Shackamaxon, now Kensington, 1830 watercolor, 13 x 18.5 cm. Bb 862 B756 #14. Easton, Alexander. Dyottsville Glass Works, 1858 lithograph, 13 x 22 cm. Stauffer Collection v. 1 p.56. Old Log Cabin. Yeakle Residence, Germanton Ave. and Mermaid Ave. Campbell Collection, v.36 p.73-76.